The M77C1 is the first Canadian iteration of the of the British designed M777 155mm howitzer. Bought from the Americans, the M777C1 is the same model of the American M777A2 model. 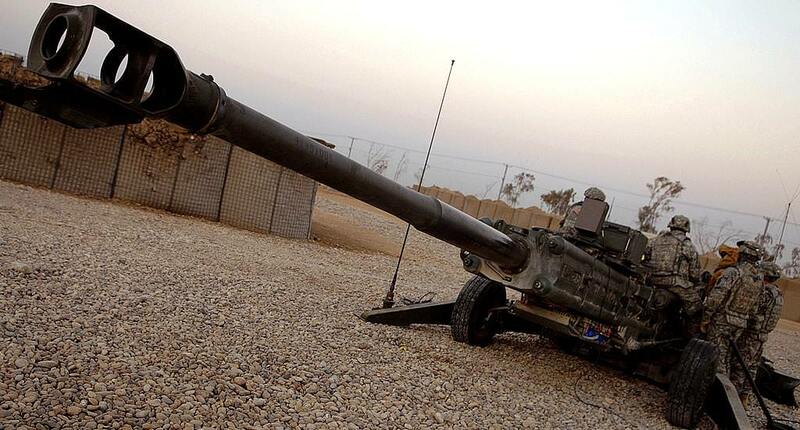 It was purchased to replace the fleet of M109A4 self-propelled guns in Canadian service: the reason being that the M109 fleet was too costly to maintain and a cheaper option came in the form of the M777C1 Lightweight Towed Howitzer (LWTH). The M777 was originally designed by the Vickers Shipbuilding and Engineering Armament division in Britain. However, this company was bought out by BAE Systems, which ended up responsible for the design, construction, and assembly through its US-based BAE Systems Land and Armaments group. The M777 is made up of about 70% US made parts. Its purpose was to grant the artillery regiments a more lightweight and air-portable option to take them to more remote places that self-propelled guns just couldn't reach. The M777C1 weighs in at just only 9,300 lbs (4,200 kg); this is a considerable weight difference when compared to the M109A4, which comes in at a whopping 27.5 tonnes (24.9 tons) or about 55,000 lbs (24,947.6 kg). The gun is able to propel a 98 lbs (43.2 kg) projectile upwards of 35 km at a full propelling charge (i.e. white bag, charge 7) or a GPS-guided Excalibur projectile upwards of 40 km with a devastating effect. It has a sustained rate of fire of 2 rounds per minute and a maximum rate of fire of 4 rounds per minute. In Canadian military service, soldiers are trained to perform what is called 'Tank Alert Drills' where they use a direct vision gun sight to engage enemy armored units at a minimum of just 500 meters. A plethora of different types of projectiles are fired, including high explosive, illumination, smoke (white phosphorus), smoke (hydrochloric), chemical harassing agent (CS gas; similar to tear gas) and anti-tank (high explosive squash head; HESH). The gun is equipped with the 'Digital Gun Management System' (DGMS) which allows the Canadian Army to lay the fire down with greater accuracy than with the panoramic telescope. Many major components on the gun are powered by hydraulics which tend to fail in the harsh winters in Canada, leaving many to wonder why they are still used at all. The M777C1 was first fired by Gunners of B Battery of the 1st Regiment Royal Canadian Horse Artillery [my own regiment] in December of 2005. An order had been placed for six guns and all six were deployed to Afghanistan in early 2006. Those six guns were purchased from the United States Marine Corps under the Foreign Military Sales contract. They were deployed in support of Operation Archer in the Canadian Theater of Operations in Kandahar Provence. Those six guns played a key role in the Battle of Panjwaii that summer, with just two of the guns being able to eliminate 72 Taliban combatants. In late fall of 2006, the guns were equipped with the 'Digital Gun Management System' allowing for greater accuracy at longer distances than with just the panoramic telescope. Today, a full gun detachment consists of 10 troops, but most only have around 6 or 7. Nice info there PFC Gadde. Nice read. We are still stuck with the ol' M119 105mm or M109A6 Paladin in Charlie atm... here is to hoping! Charlie guys remember we have the magic arty computer off on our servers and you will need to calculate with this.